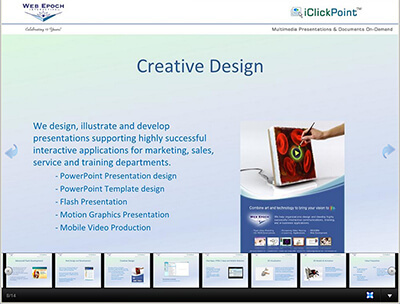 Epoch Share™ – let users view your custom presentation without having a PowerPoint Player. Web Epoch developed the player for your execution of your presentation while mobile or inside your CRM like Salesforce.com. Your prospects and clients can see your proposed presentation in their web browser on multiple devices such as desktop, iPad and HTML 5 Tablets, iPhones and Smart Phones. You set the expiration date to create a call to action for your would-be client to act quickly. Our unique channel feature allows you to organize your content by brand and groups such as employees, dealers and external consultants. You can share your presentations as private (requires log-in) or public links with colleagues, clients, and prospects. iPad & HTML 5 Tablet optimized. You can share your presentations as private (requires log-in) or public links with colleges, clients and prospects. The presentation will expire on set date.